Welcome back to my blog! Holy crap it’s been almost 5 months since my last post. That’s insane. I have no excuse, I’ve been lax in my blogging admittedly. I started this journey over 2 years ago on Ideal Protein, then transitioned over to Weight Watchers. My weight has gone up, down, and up again, and now down again, and I’m starting to learn that it’s OK.
I’m fighting the good fight though, and knowing that TRYING is better than doing NOTHING. I’m far from perfect as you can see. This is all about accountability and transparency. So here is me being accountable: I still have 20 pounds that I WANT to lose. Here’s me being transparent: I CAN DO THIS, but it MAY take LONGER than I WANT. At the end of the day though, I’m 29 years old, I’m sure that fighting weight will be something I fight for a very long time, and I’m really just getting into the second battle, as it were. My current weight: 186.0 as of yesterday morning (thank you nice people at Weight Watchers for not judging me too harshly). 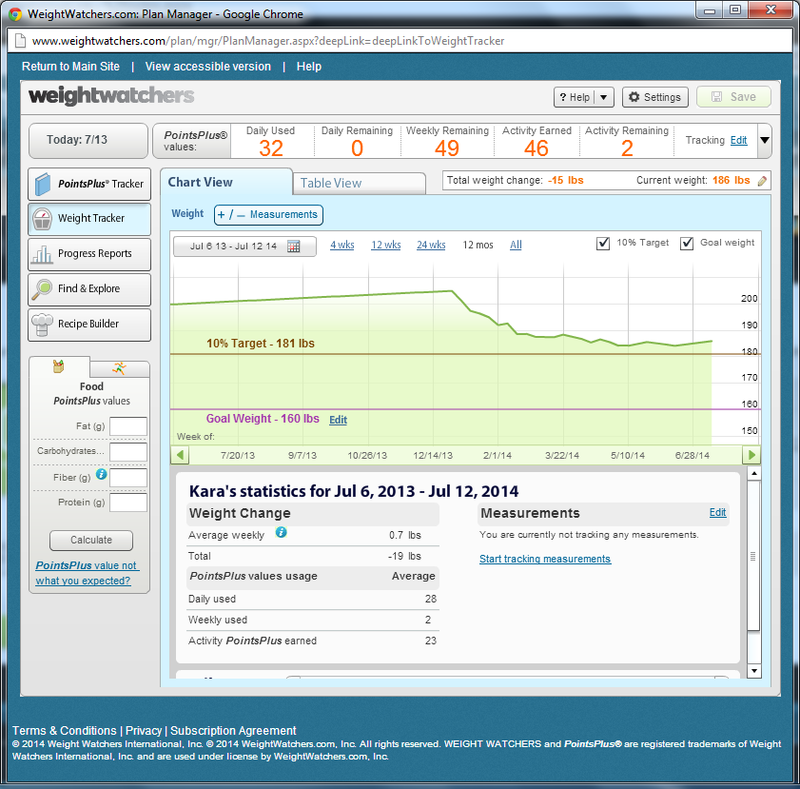 My weight on January 15th when I weighed in for the first time at Weight Watchers: 201. I have been down to 184 between then and now, and when I did Ideal Protein I bottomed out at 162, which had no muscle at all and still managed to be flabby. This time, my goal is 165 but to have some actual MUSCLE under the flab as well as a healthier heart. What I’m doing to move the scale this week: 31 miles on my bike yesterday, 20 miles on my bike today, hopefully at least 10 miles on my bike tomorrow (back to work for me, and it’s harder for me to bike to work going up hill for a measly 4 miles than do the whole bike trail of 20 miles). I’m back tracking my food on my Weight Watchers Mobile App, but am honestly pushing more for the exercise this week than the food. So EVERY day I’m going to try to do SOMETHING physically demanding for at least an hour. That does NOT include my half an hour walk at lunch, no. This is an hour of something that makes me sweat. So if it’s not bike riding for a night, then it’ll be me going for a (shudder) run/jog or going to a Zumba class (kind of shudder, it’s $10/class). Thanks for swinging by to my blog, I promise to work on updating a bit more frequently than once every 5 months! Zoe Goes Running…Tour De France on foot??? So, I stumbled on some random Time.com Health article that talked about how this woman started running, yes running the Tour De France on May 15th and plans to finish the 2,000 mile (yes, 2 thousand) journey before the bikes finish. She wrote a blog called Zoe Goes Running, and I’m having a blast reading about her adventure. So, this is me, in all my glory, no makeup. My husband and I were bored at home so we jumped on the bicycles and rode 3 miles to come get some shakes at a downtown diner. I’m not perfect, slender or high maintenance, but I’m learning to love myself. I sunburn within seconds it seems, my thighs jiggle when I don’t want them to, and I have circus feet and hands (freakishly small). 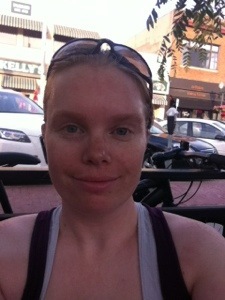 I look like a dork when I am riding my bicycle but feel like a queen. I’m learning to ride the bicycle instead of my motorcycle, especially when I want to just jump in the car and go for a quick trip to the store. I smile really big, and cry more easily than I should, but that’s OK. I laugh when I’m upset or angry because I don’t like to show frustration or anger to people. This is me, and that’s OK. So it’s official, I rode our entire bike trail yesterday, and a little doubling back, for a total of 26.6 miles, with an average speed of around 12 mph the first half when I rode with friends, and a solid 14.4 MPH on my way home on my own. That’s right folks, just because I was alone didn’t mean I slacked off, and I have the charts to prove it! Don’t believe me? Check out my Strava Profile!